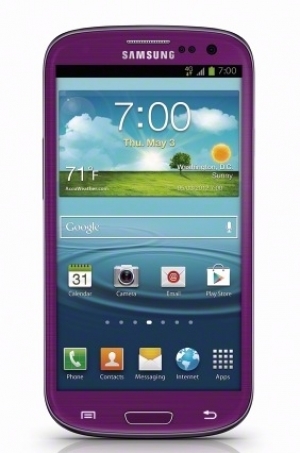 Sprint offers Galaxy S3 in purple | Android Blast! Sprint is now offering the Samsung Galaxy S3 in Amethyst Purple. The color option is exlusive to Sprint. This is an interesting move considering the Galaxy S4 will soon be out. The purple S3 includes 16GB and sells for $99. Of course you will have to sign a new two-year contract to get the $99 price, and you will have to apply for a $50 rebate. Anyone up for a S3 on Sprint?